alaTest has collected and analyzed 11 reviews of Dell Inspiron 3000 Series i3847-4617BK Desktop, 3.2 GHz Intel Core i5-4460 Processor, 8GB DDR3, 1TB HDD, Windows 8.1 (Certified Refurbished). The average rating for this product is 4.7/5, compared to an average rating of 4.1/5 for other Desktops for all reviews. People are impressed by the design. The usability also gets good reviews. We analyzed user and expert ratings, product age and more factors. 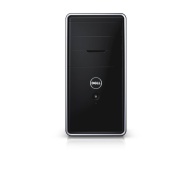 Compared to other Desktops the Dell Inspiron 3000 Series i3847-4617BK Desktop, 3.2 GHz Intel Core i5-4460 Processor, 8GB DDR3, 1TB HDD, Windows 8.1 (Certified Refurbished) is awarded an overall alaScore™ of 89/100 = Very good quality.